Atlassian is proud to present FishEye 2.9, which provides the simplest and most powerful integration with the latest version of JIRA that FishEye has ever had. Visit our issue tracker to see the full list of improvements and bug fixes in FishEye and Crucible for this release. 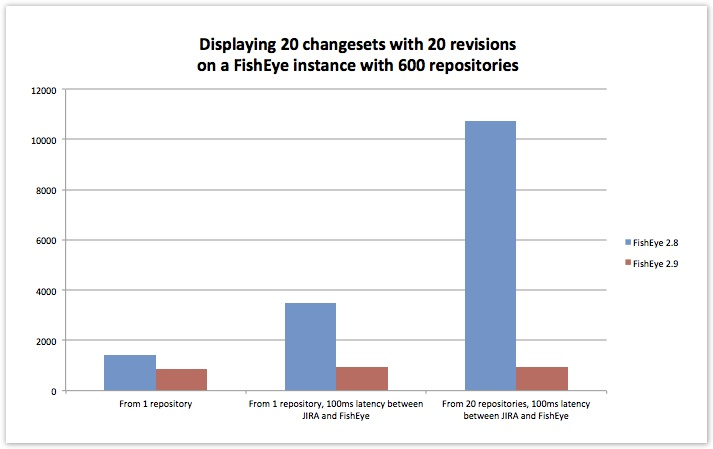 See the change log for FishEye 2.9.x minor releases. Upgrading from a previous version of FishEye. Upgrading FishEye should be fairly straight forward. We strongly recommend that you back up FishEye before upgrading. Please refer to the FishEye 2.9 Upgrade Guide for essential information about upgrading. Known issues. Please check the important technical advisories on the front page of the Knowledge Base for information about any known issues for this release. JIRA 5.0 integration. The features described below are supported by JIRA 5.0, or later, with the latest version of the JIRA FishEye plugin . Please log your votes and issues . They help us decide what needs doing, and are much appreciated! Before FishEye 2.9 you had to create links from FishEye to particular JIRA projects in order to see your issue data in FishEye. Without doing this, you just wouldn't see data for projects that were not linked to FishEye. Now, with the FishEye 2.9 release, you no longer have to create those project-specific links because all of your JIRA data is accessible in FishEye as soon as you link your instances together. Not only will you save time from not having to administer all the separate FishEye/JIRA links, but your FishEye instance is now also smarter and gets data from all the projects existing on your JIRA server. Note that project links remain available in FishEye 2.9, but they now act as a restriction on the integration. 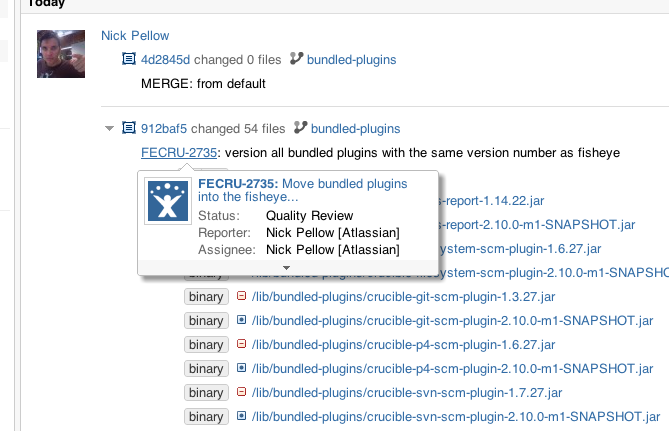 If you set up project links from FishEye to JIRA, only issues from those particular projects will be linked in FishEye. Part of the effort of revamping the JIRA integration was to improve the performance of the issue source tab, especially for large instances with multiple repositories, each with many changesets. The chart below shows the performance gain in FishEye as a result of the effort to make it scale well as your data grows. We removed the Remote API setting from the Server Settings page. From this release onwards the Remote APIs will always be accessible, to make the JIRA integration straightforward. As of this release, it no longer makes sense to disable the Source and Reviews tabs when Project Links are not configured. If you still wish to disable the Source and Reviews tabs for a specific project, for example for one that has no relation to source code, you should use project-level permissions. See How do I disable the FishEye tab panel for non-code projects? In order to facilitate file browsing, and to give a clearer interface to see all the modifications and comments on a particular file, we are now showing one file at a time in the Changeset view. You can use the file tree or the keyboard shortcuts to navigate between files.